Guptakashi, Gupta Kashi or Guptkashi (Sanskrit: गुप्तकाशी) is a fairly large village located at an elevation of 1,319 metres (4,327 ft) in the Kedar-khanda ('khanda' means "sector"), in Garhwal Himalayas of Rudraprayag district in Uttrakhand, India. It is famous for the ancient Vishwanath Temple - dedicated to god Shiva - similar to the one in Varanasi (Kashi). 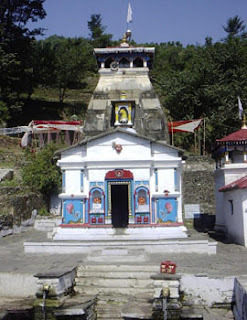 The other famous temple here is dedicated to Ardhanareshvara (a half man half woman form of Shiva and Parvati). The name Guptakashi has legendary significance linked to the Pandavas, the heroes of the Hindu epic Mahabharata. Its religious importance is considered next to that of Varanasi, believed to be the most pious of all Hindu pilgrimage places. The temple town is located on the way to the Kedarnath, one of the Chota Char Dhams and Panch Kedars. 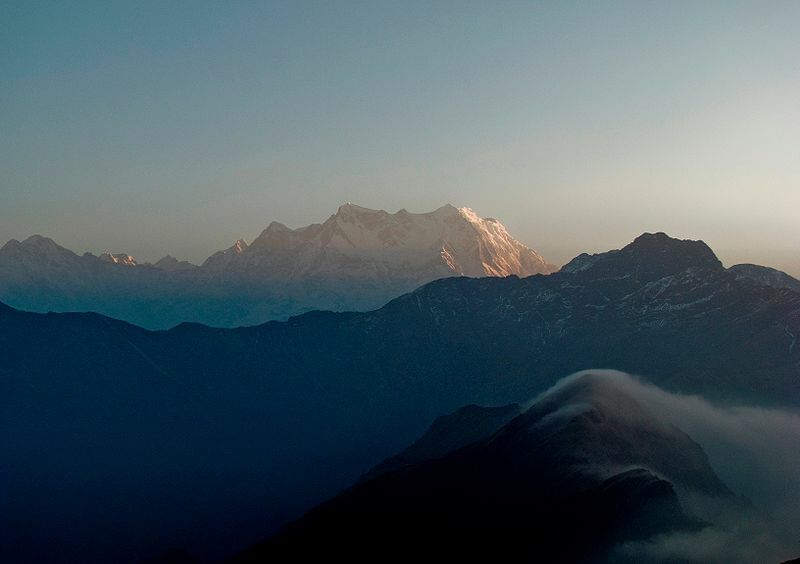 It has the scenic backdrop of the snow covered peaks of Chaukhamba and enjoys a salubrious weather throughout the year. Popularly-narrated legend holds that subsequent to the Kurukshetra war of the epic Mahabharata, the Pandavas on the advise of god Krishna and other sages wished to atone for their sins of fratricide and Brāhmanahatya committed by them during the war by seeking pardon from Shiva and also pray for his blessings before attaining salvation. But Shiva was not willing to meet them since he was annoyed with them for the unjust events of the war. He, therefore, avoided meeting them at Kashi and went incognito as the bull Nandi to Guptakashi in Uttarakhand. But Pandavas pursued him to Guptakashi and recognized him in the disguised form of Nandi. When Bhima, the second Pandava brother tried to hold the bull by its tail and hind legs, Nandi vanished from Guptakashi, into the ground (into a cave for hiding), but reappeared later as Shiva in five different forms namely, hump at Kedarnath, face at Rudraprayag, arms at Tungnath, navel and stomach at Madhyamaheshwar and the locks at Kalpeshwar. The vanishing act of Shiva gave the name Guptakashi (hidden Kashi) to this place on the bank of the Mandakini River. In the upper reaches of the Bhagirathi River, there is another Kashi, called the Uttarkashi (North Kashi). Mythology also states that Shiva proposed to Parvati at Guptakashi (on the road to Kedarnath) before they got married in the small Triyuginarayan village at the confluence of Mandakini and Sone-Ganga rivers. According to Puranic literature, Kashi and Kanchi (Kanchipuram) are considered as two eyes of Shiva. Keeping this connotation in view, six more "Kashi"s have been prescribed to be as sacred and spiritual as the main Kashi - Varanasi. Pilgrims, who cannot undertake the long journey to the main Kashi, can travel to the closest Kashi. The six other "Kashi"s cover all the regions of the country. These are: Uttarkashi and Guptakashi in Uttarakhand in Northern Himalayas, Dakshinkashi in southern India, the Guptakashi in eastern India is at Bhubaneswar, the Kashi at Nashik (also Paithan) in western India and a Kashi in Mandi in Himachal Pradesh in Western Himalayas. The Puranas state that all the Kashis have the same degree of sanctity and reverence as the main Kashi - Varanasi. Another legend declares that when the Mughal emperor Aurangzeb demolished the Kashi Vishwanath Temple in 1669, and constructed Gaynvapi Mosque (he had even renamed Varanasi as Mohammadâbâd), the Shiva Linga was shifted to Guptakashi for safe keeping. But the original linga of Kashi Vishwanath is stated to have remained here from the time it was shifted. In a small pond (kund) called the Manikarnika Kund here, in front of the temple, a Shiva-linga is bathed by two springs, representing the rivers Ganges (Bhagirathi) and Yamuna. The Yamuna spring water emanates from a goumukh (spout in the shape of a cow’s mouth) and the Bhagirathi spring flows through trunks of two elephants strategically placed above the linga. It is approachable from Rudraprayag by road over a distance of 24 miles (39 km). Rudrprayag is approached from Haridwar or Rishikesh by the National Highway, which goes to Badrinath and beyond. It is 178 kilometres (111 mi) from Rishikesh. mountain climbing / treks, are a world into themselves. Ascending the heights and being a part of the Himalayan landscape is an experience beyond comparison.